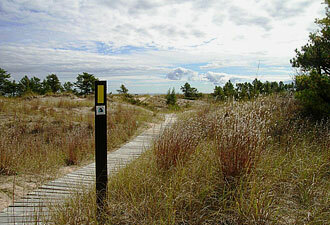 A boardwalk allows hikers to cross a fragile environment. It's late summer, you're probably hot and sweaty, and you want an oasis of cool surroundings to help you beat the heat, right? How about taking a hike on the Ice Age National Scenic Trail? While I can't guarantee your “cool surroundings” will be due to reduced temperatures (although you never know in Wisconsin), I can say with confidence that exploring the Ice Age NST is always a cool way to spend time outdoors. More than 10,000 years ago, the last glacial advance into Wisconsin receded for the final time, leaving behind a spectacular array of geologic features. More than 50 years ago, citizen volunteers of the Ice Age Park & Trail Foundation (IAPTF) began to create a thousand-mile footpath — Ice Age Trail — which followed the glacier's southernmost edge and brought hikers in close contact with drumlins and eskers, kettles and kames, and other landforms created by glacial activity. In 1980, the trail became part of the National Trails System, and the Ice Age National Scenic Trail was born. The National Park Service partners with the Ice Age Trail Alliance (formerly the IAPTF) to continue building, maintaining, and promoting the trail. The Ice Age NST accommodates hikers of all levels of experience, but anyone embarking on the trail is greeted with a challenge: the choice of which section of this varied route to explore first. Perhaps you'll start with the eastern terminus of the trail, found in the Door County Peninsula. Begin your jaunt in Potawatomi State Park and walk through beautiful forests along limestone cliffs, which overlook Lake Michigan. Or, explore the trail through the more urban setting of Sturgeon Bay, where tiny shops offer everything from fudge to locally grown cherries and apples. Want something a bit more remote and rugged? Try exploring the Ice Age NST in Taylor County as it crosses the Chequamegon National Forest and skirts the Mondeaux Flowage. French trappers, early missionaries, and loggers all inhabited this area at different times throughout history. The glaciers in this north-central portion of the trail left behind kettle lakes, erratics, and eskers. 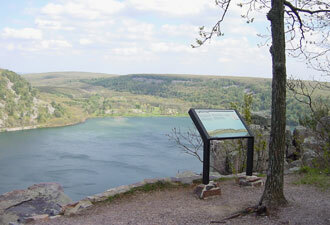 The western terminus of the Ice Age NST is found in Interstate State Park, just outside of St. Croix Falls. Here, glacial potholes dot the trailside landscape, and hikers enjoy spectacular views of the St. Croix River at the Dalles of the St. Croix gorge. An interpretive center is located within Interstate State Park and contains educational displays about the Ice Age. Don't know your kettle from a hole in the ground? That's okay. Another cool way to explore the Ice Age NST and learn about glacial formations is to go “ColdCaching.“ Similar to EarthCaching, ColdCaching has participants seek out Ice Age features along the trail using GPS technology, practicing Leave No Trace ethics as they go. 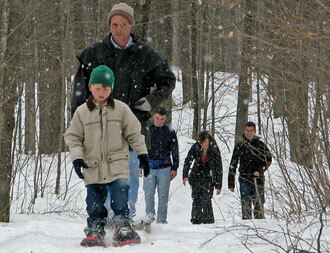 Are you ready for your prehistoric adventure on the Ice Age NST? Just follow the yellow trail blazes!